Why is it that private foundations spend so little of their endowment on mission investing? Is there an opportunity to make it bigger? In this paper you will find an explanation of the barriers to mission investing, also known as Program Related Investment and Mission Related Investment, and a concluding hypothesis about what it will take to help remove the barriers. Educating foundation leadership, building foundation staff expertise, improving data quality and lowering the cost of making a mission investment are all issues to understand and address. If our hypothesis is correct, the time is now to build the necessary data, education and support capabilities to help private foundations better access private sector investment tools to advance their mission. The number of private foundations in the U.S. and the amount of their endowments has grown considerably over the past decade (see Appendix Chart A). In 2013, 87,000 U.S. foundations collectively held about $800 billion in endowments. Such foundations annually spend at least 5% of their endowments, typically on grants and support costs to benefit their charitable missions—funding that totaled a minimum of $40 billion in 2013. However, few foundations actually go further and use social impact investing tools—such as Program Related Investment (PRI) and Mission Related Investment (MRI)—to advance their charitable missions beyond grant making. PRIs/MRIs have the potential to not only further the mission of a foundation, but also unlock additional financing for social initiatives. Yet, while many foundations have explored opportunities to leverage PRIs/MRIs to further their missions, the level of such outlays is surprisingly small, comprising less than 2% of private foundation endowments. Why? A number of barriers exist that prevent the broad use of such social investing tools. These barriers should be understood and addressed to potentially expand the depth, breadth and use of private investing tools since they have the possibility to greater amplify a foundation’s core mission as well as provide subsidized debt or equity to social enterprises. If private foundations spent 3% more of their endowments on PRIs and MRIs, an additional $24 billion in capital could become available to enable improved sustainability of social enterprises and the recycling of philanthropic capital. Social impact investing allows foundations to support their charitable missions beyond just grant making. While charitable grants are rarely repaid, investments in social enterprises have the potential to generate a financial return for the foundation, thereby boosting the pool of money available for future grants or investments. Both PRIs and MRIs provide some level of financial returns from the social enterprises they invest in. But PRIs and MRIs are characterized and treated differently by the Internal Revenue Service. A PRI can be counted, along with grants and program support costs, towards the 5% minimum payout required for private foundations annually. The returns on the investment, in the year they materialize, are added to the 5% minimum payout requirement for that year, which serves to recycle the philanthropic capital. What’s more, there is no limit on the actual return on a particular investment, as long as charitable purpose is the primary consideration when making such investment. There are no prescribed limits on the size of the investment, the type of investment vehicle or the type of enterprise receiving the investment. A review of data from the Mission Investors Exchange, a group comprised of 230 foundations and mission investing organizations, shows that the size of PRI commitments varies considerably: from $20,000 to $76 million (See Chart B). Investments can and have been made in a wide range of entities including small non-profit organizations, biotech startup businesses and publicly traded corporations. There is a wide range of strategic approaches to the use of PRIs and MRIs. Among 29 foundations that have most aggressively implemented mission investment strategies, two thirds have invested less than 5% of their endowments over six years. Within the same six-year period of 2010-2015, the range of investments among those foundations has spanned as low as 1% of an endowment (e.g. Robert Wood Johnson Foundation) to nearly 40% of an endowment (Consumer Health Foundation) (see Chart D). Endowments of this set of foundations vary from $14 million to $42 billion, with the higher use of PRIs and MRIs found among the smaller foundations. In other words, while some may presume that PRIs and MRIs are a tool for larger foundations, it appears that smaller foundations are more aggressive in their use. In order to assess whether mission investing is an appropriate tool to achieve programmatic impact, foundation leadership should understand a spectrum of strategic choices. Charts C, D and E show the range of approaches taken by private foundations, the degree of PRI and MRI use, the range of sectors chosen, and the types of asset classes. Unlike most grants, an investment can infuse much-needed capital into organizations with incentives to build a sustainable business model, e.g. generate cash to provide a return, build disciplined business practices around planning and resource allocation, etc. There is also the potential to attract additional capital by reducing risk for other more traditional investors through taking a first loss position or providing a guarantee (such as a loan or volume guarantee). For example, private foundations have offered to guarantee the purchase of vaccines and medical devices for use in the developing world as an incentive for private corporations to deliver those vaccines at a dramatically reduced price. Finally, the capital invested in a PRI or MRI will likely be returned in the future for recycling into the mission—creating a multiplier effect on social impact. A question to consider is whether there are investable opportunities consistent with the foundation’s mission and programmatic goals. Unfortunately, there is a lack of consistent data to help understand the outcome and investment performance experienced by other foundations in social sectors such as environment, education and health. (Chart E provides summary level information on investments across sectors by asset class). Anecdotal information and some data are available to help guide the strategic and tactical options available to foundation leadership through such sources as the Mission Investors Exchange, Nonprofit Finance Fund and the Foundation Center. A well thought out theory of change developed by foundation leadership is also an extremely useful point of departure to focus this assessment, i.e. how will a mission investing strategy advance the mission. Program officers given the task of executing a mission investment may lack sufficient understanding of financial transactions and for-profit business models; investment professionals may focus on financial return at the expense of program goals and become too risk averse in achieving program goals. Existing grant making processes may not be suited for managing the flow of PRIs and MRIs such as sourcing, due-diligence and portfolio management. For example, the legal and financial analysis required to complete a debt or equity investment is substantially different than what is required for a grant. When and how external support can be sourced (e.g. consultants and legal expertise). While third party providers can be critical to the successful and appropriate use of mission investing, the consulting, business development, legal and fund management skill and experience required to effectively support deal sourcing, due diligence, execution and management of a mission investment portfolio are not fully developed yet or in the preliminary stages of development. To enable appropriate depth and breadth of mission investing, lowering the cost and improving the accessibility of this expertise will be critical. The private sector, academic community, philanthropy (and potentially government agencies) could collaborate to construct the infrastructure necessary to lower the costs and enhance the expertise to lower this critical barrier. The following chart preliminarily depicts a somewhat complex system that private foundations and social enterprises would need to navigate in order to actively consider using PRIs and MRIs as useful tools to achieve their philanthropic goals. One weak element in this system is the lack of consistent data to enable a strong feedback loop between the initial investment and the programmatic and financial outcomes from the investment over time. For example, the data in the Mission Investors Exchange database, which is the primary source of the data presented in this paper, is self-reported exclusively by foundations on a voluntary basis and therefore does not represent all mission investing by foundations in the U.S.
Further, the data only represents the investment at the time it is made and does not track performance over time. Investment in the infrastructure to improve the feedback loops should significantly enhance transparency and understanding of mission investing. 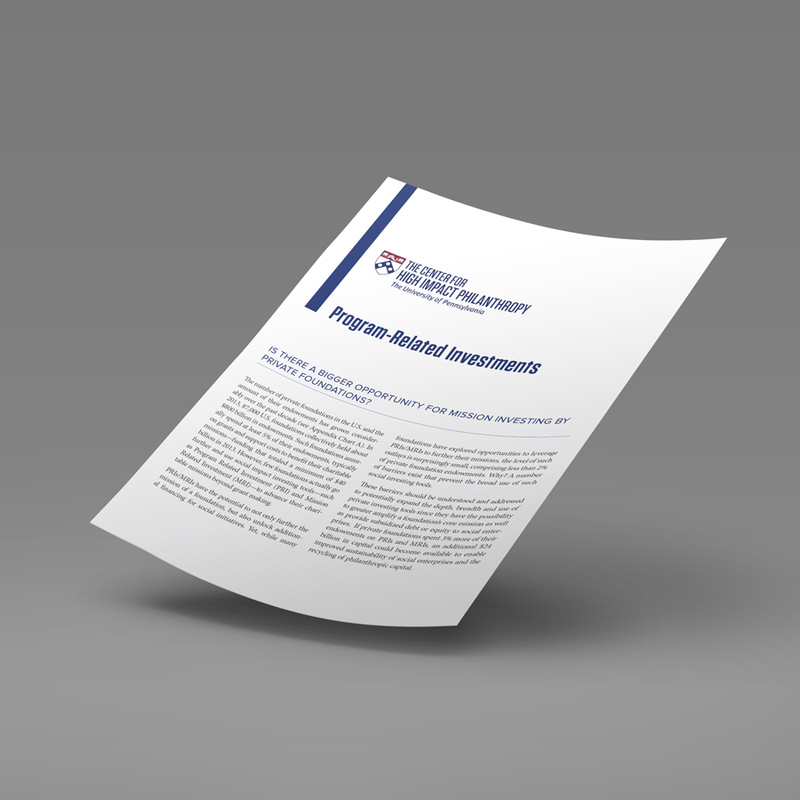 Legal requirements and costs can also be significant, which may result from a lack of clarity regarding the specific elements necessary for an individual investment to qualify as a PRI. Further work with foundations and legal experts with experience in implementing PRIs may be necessary to determine if it is useful to develop a set of recommendations for consideration by the IRS and other policy makers. Improve access to and reliability of financial and social outcomes data associated with PRIs and MRIs by developing a system that can sustainably capture related financial and social outcomes data, in order to (1) enable foundations to better understand the impact of PRIs and MRIs, (2) allow for benchmarking of investments and (3) provide analytics and insight for the impact investing community. Demonstrate a simpler and more efficient approach to financial, legal and social outcomes due diligence by developing a sustainable shared service enterprise (center of expertise or “clinic”) consisting of experts, faculty and students that can support foundations and social enterprises in executing PRIs and MRIs. Successfully building one or all of these capabilities at an academic institution has the potential to create powerful enablers for broader and deeper mission investing, accelerate positive social impact and recycle significant amounts of philanthropic capital. At the University of Pennsylvania, the Center for High Impact Philanthropy, in collaboration with colleagues from the Wharton Social Impact Initiative, is developing plans to test this hypothesis.